Decorated with golden shark's tooth banding. White porcelain. Border, stylized Christmas trees and stalwart nutcrackers; holly garland and dainty gold and green accents. Cup, 5 ounces. White porcelain. Border, stylized Christmas trees and stalwart nutcrackers; holly garland and dainty gold and green accents. Cup, 5 ounces. Made in France. White porcelain. Multicolor Asian-influenced butterfly, branch, and blossom motif. Irregular scalloped embossed golden edge. First introduced in 1851 at the First World Exhibition in London. Original set purchased by Queen Victoria. Cup, 4 1/8"H. Made in Hungary. Balcon du Guadalquivir bread and butter plate. Design inspired by the ironwork found in the towns of Andalusia. Fine porcelain. Balcon du Guadalquivir bread and butter plate. Design inspired by the ironwork found in the towns of Andalusia. Fine porcelain. 6.7"Dia. Made in France. 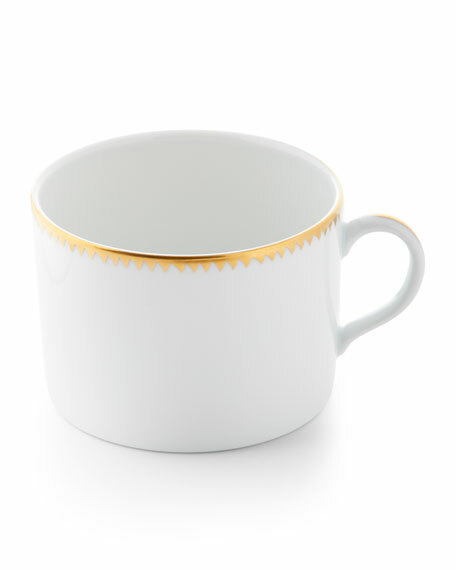 Limoges porcelain mug. Hand-painted 24-karat gold detail. Holds 8 ounces. 3.3"W x 2.5"T. Not microwave safe. Dishwasher safe. Made in Portugal.